Hello, Welcome!! HOPE DRIES THE TEARS ON THE CHEEK OF WOE. A saying from Dinka tribe. 1 Hello, Welcome!! HOPE DRIES THE TEARS ON THE CHEEK OF WOE. A saying from Dinka tribe. 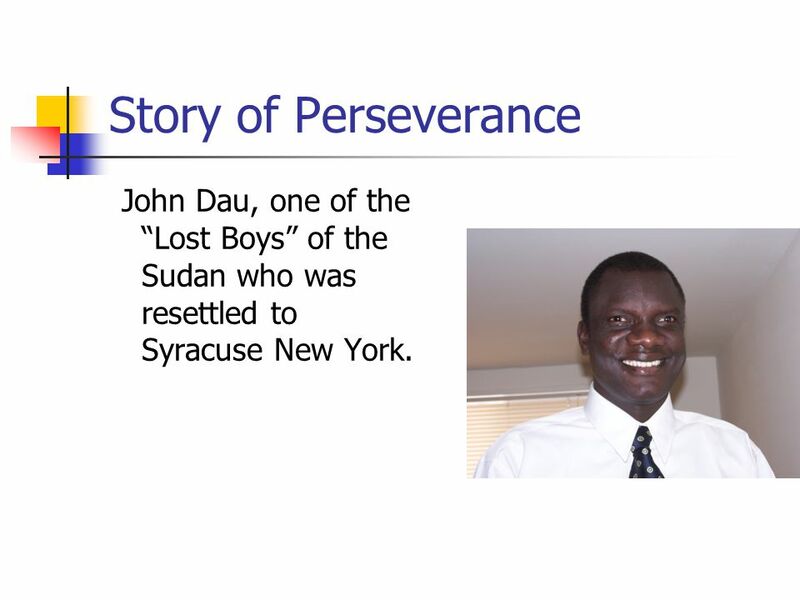 2 Story of Perseverance John Dau, one of the “Lost Boys” of the Sudan who was resettled to Syracuse New York. 3 Before the Attack Life was excellent There was a lot of food It was peaceful at home. 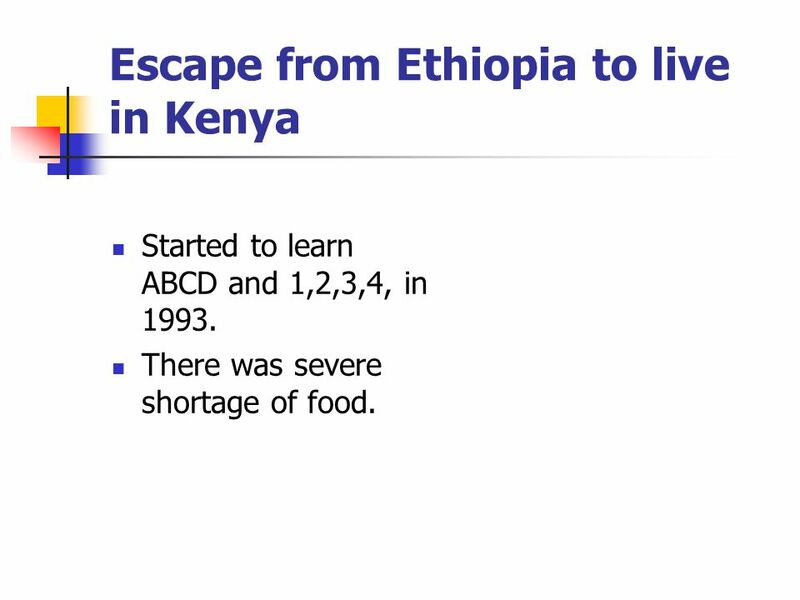 5 Escape from Ethiopia to live in Kenya Started to learn ABCD and 1,2,3,4, in 1993. There was severe shortage of food. 6 Coming to America was good news In 1998, we heard that we will be going to America soon. There were processes involved to get us ready to come to America, this was in1999. 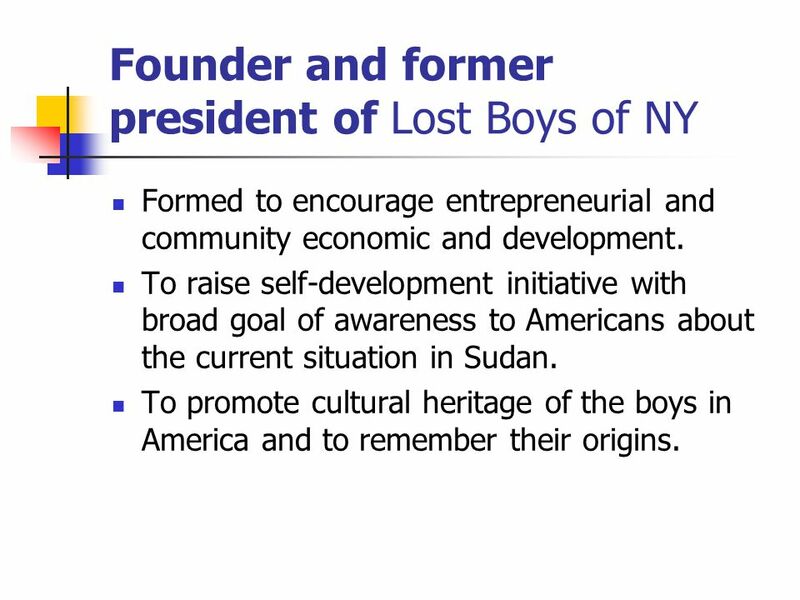 9 Founder and former president of Lost Boys of NY Formed to encourage entrepreneurial and community economic and development. To raise self-development initiative with broad goal of awareness to Americans about the current situation in Sudan. To promote cultural heritage of the boys in America and to remember their origins. 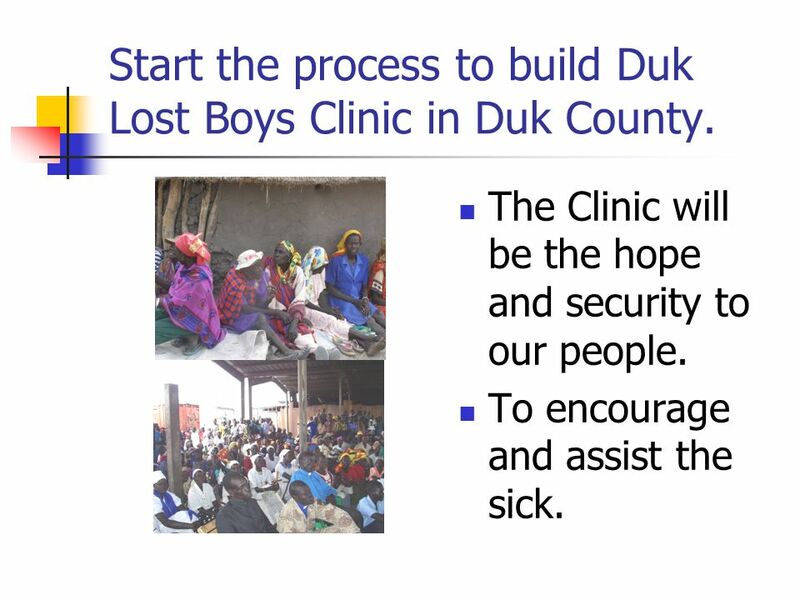 10 Start the process to build Duk Lost Boys Clinic in Duk County. The Clinic will be the hope and security to our people. To encourage and assist the sick. 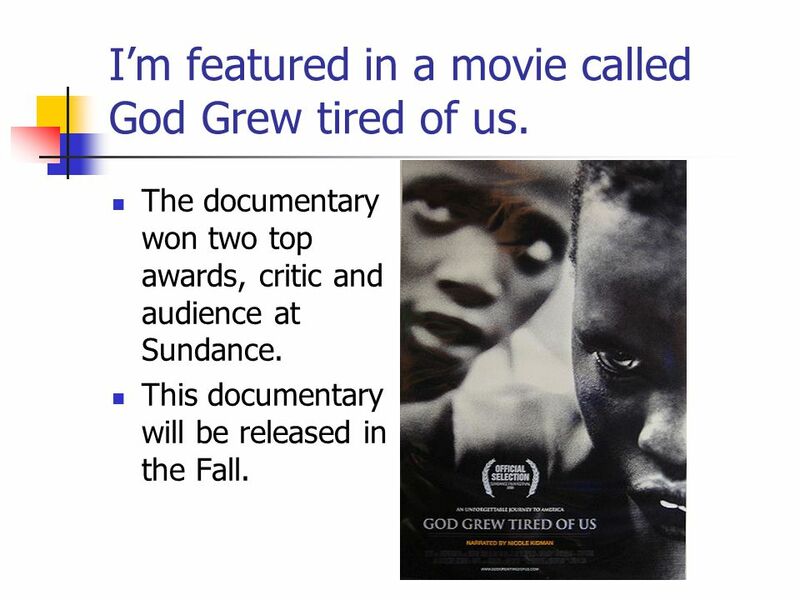 12 I’m featured in a movie called God Grew tired of us. The documentary won two top awards, critic and audience at Sundance. This documentary will be released in the Fall. 13 Never, ever quit! 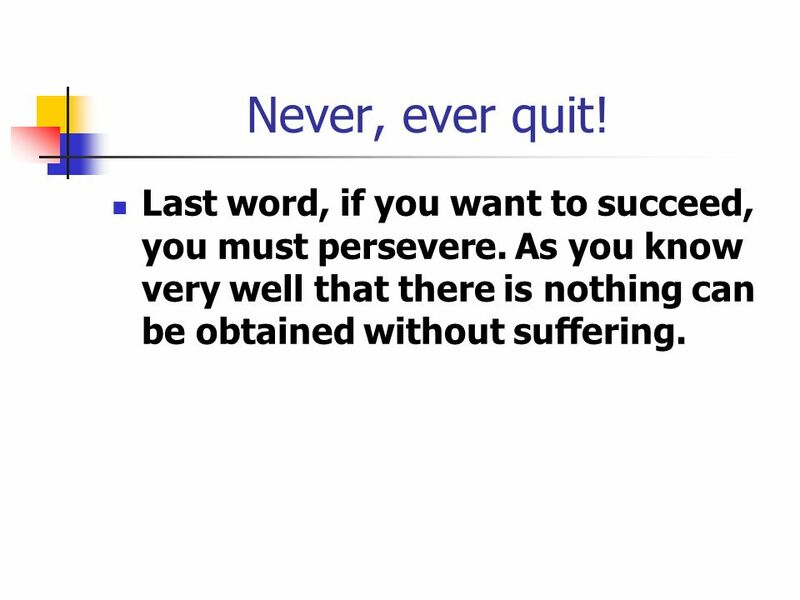 Last word, if you want to succeed, you must persevere. As you know very well that there is nothing can be obtained without suffering. Download ppt "Hello, Welcome!! HOPE DRIES THE TEARS ON THE CHEEK OF WOE. 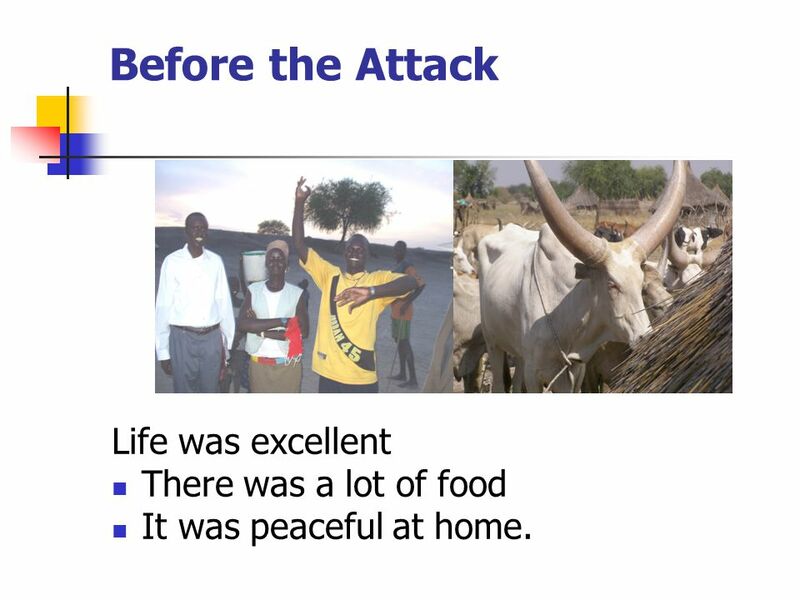 A saying from Dinka tribe." Remembering 1955-A Golden Year First off, I want to thank the author of the original pictures and the wonderful sayings that reflect the great years of. WHAT IS A GIRL What is life like for a refugee girl? 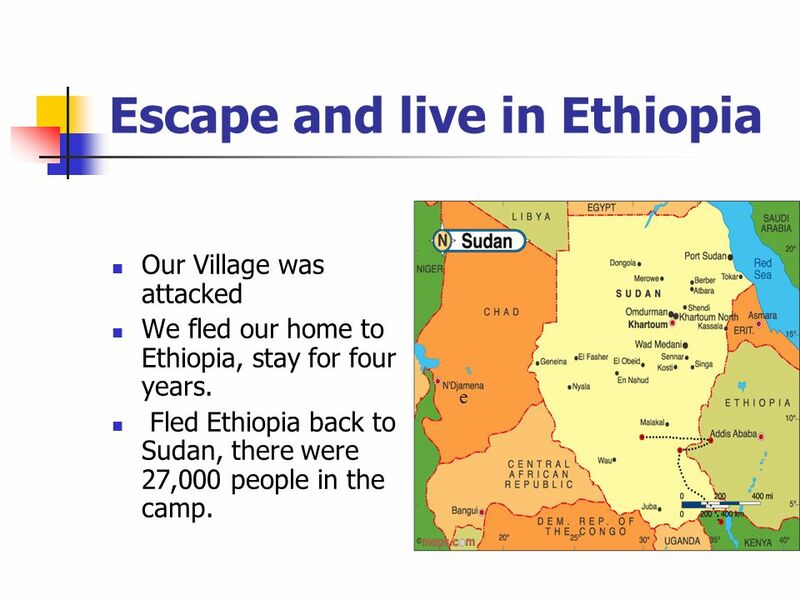 Voices of refugee adolescent girls at Kobe Refugee Camp, Ethiopia. Europe and Me. Making the world a better place? The European Union. The Situation in Sudan Jill Hardy Huntington Beach High School. With Mohdi Ali By: Mohamed Mohamed.  Somalia is a war torn country because of a the dictatorship of Mohamed Siad Barre. He ruled as president and ruled. The hands of Jesus… in a world that hurts LOBETHAL ACTION WEEKEND 3 – 5 September 2010. Tabitha Cambodia. 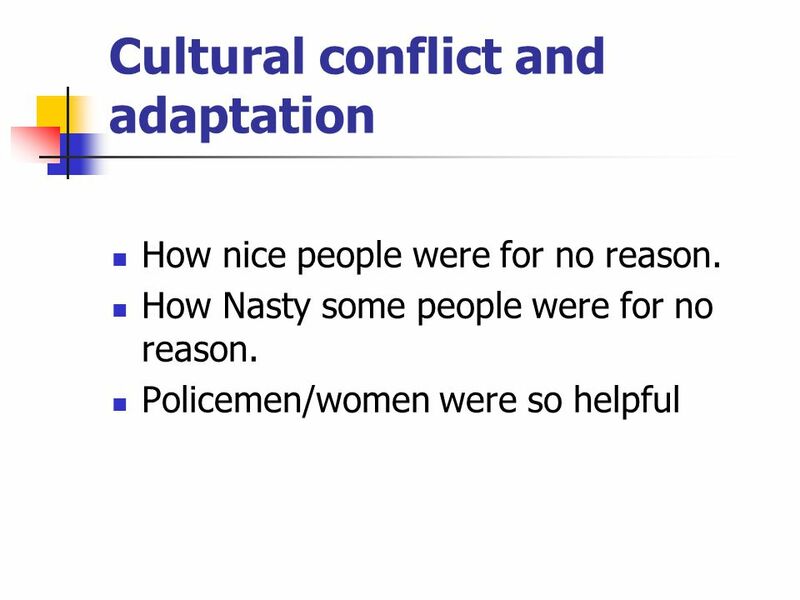 When a person begins to work in a Third World Country – they should always ask questions before they design the answers. Creating the future by empowering youth voices: digital storytelling Barbara Stripling President, American Library Association Assistant Professor, Syracuse. The Darfur Genocide By: Justin Conkling, Nate Prince, Greg Kutzin, Fioren Hasanpapaj. Each year, Cazenovia College’s first year students are assigned a significant book to read prior to their arrival at the College in the fall. God Grew. Reframing the ask… for resettlement. What images does the media use to portray a “refugee” ? Downtrodden Downtrodden Poor Poor Uneducated Uneducated Victim. STEM The BSA’s Newest Program or is it?. Science Technology Engineering Math The acronym STEM stands for Science, Technology, Engineering, and Mathematics. The Achiever The Achiever National Delta Tau Alpha Newsletter September 2006 The Road to Fall. Making Predictions. Good readers make predictions about the text they read. 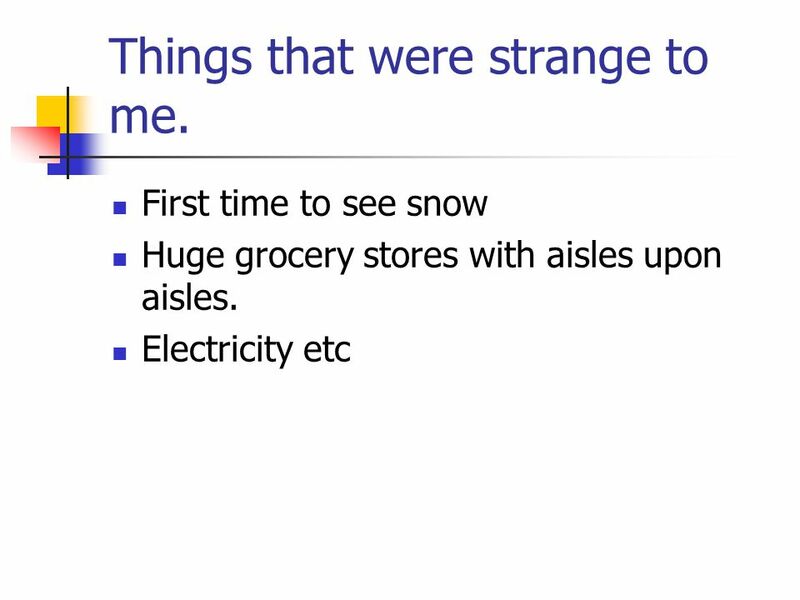 Predict before and during reading. Check your predictions by summarizing key. Sudan is found in the Northeast part of Africa; Darfur is a region in the west. Once upon a time there lived a very evil king. His name was King Treble Clef. Bellringer – Day 3 1) How many lines does a staff have? First Conditional And future time clauses 3068316.